If you're thinking about running for a ward seat for the first time in 2018, one question you may be asking is "how much influence do wards really have over who wins elections?" That's a tough question to answer since there's a ton of variation in how effective the 66 different ward organizations are at getting out the vote, but a recent blog post from Jonathan Tannen at Econsult suggests individual ward endorsements can make a real difference. 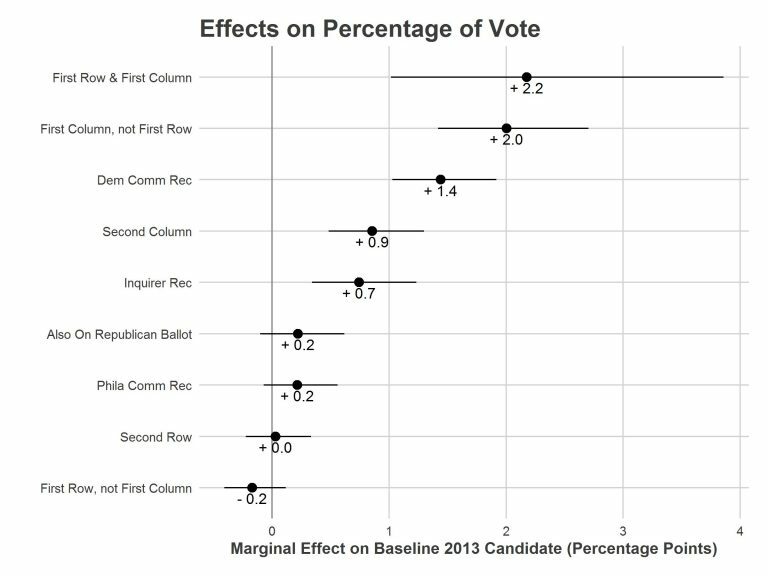 Tannen has been publishing a blog series looking at the different drivers of election outcomes in Philadelphia's 2015 Court of Common Pleas elections, and his most important finding is that the effect of ballot position is overwhelming. A candidate who lucks out in the ping pong ball drawing and gets placed on the top row, left-most column is basically a shoe-in. After ballot position effects, the Democratic City Committee's endorsement mattered most, followed by the Inquirer's endorsement, and the Bar Association's endorsement. Read Tannen's whole post for more on his process (and all the qualifiers to consider.) The data about ward endorsements comes from an interesting source: a Tumblr that aggregated photos of all the different ward sample ballots being passed out on primary election day in 2015. The Tumblr didn't have sample ballot information for every single ward, so it isn't a complete picture, but the sample was sufficiently large to be able to draw some conclusions about how well a ward's endorsed candidates fared just within that ward. The finding that local endorsements can cut through the noise from ballot position effects under certain circumstances is encouraging news, since it shows that putting the work into building a well-organized ward group where you live can have a real and measurable impact for getting the candidates you like into office.